There is nothing sweeter than enjoying time with our girls on a sweet summer day. They bring us so much pleasure, despite all the hard work we put into each day. Lately, I’ve been travelling a bit for work. It’s been fun, but it’s also been hard. It’s tough not to wake up to their mischievous little laughs in the morning. They have both learned how to undress herself already and, no, this is not a good thing. I have woken up many a morning to find them in bed playing with a diaper, with Zoe’s little tush hanging out of her barely-on pajama pants…and what does she do? She giggles when she sees me, and politely hands me the wet diaper. Eva is no angel either. She is a little ball of mischief and all play. When it’s time to get her out of the crib, she lunges back down to lay down, and pretends to go back to sleep! She does this for a few seconds until she’s good and ready to get up. Oh the joy they bring me! 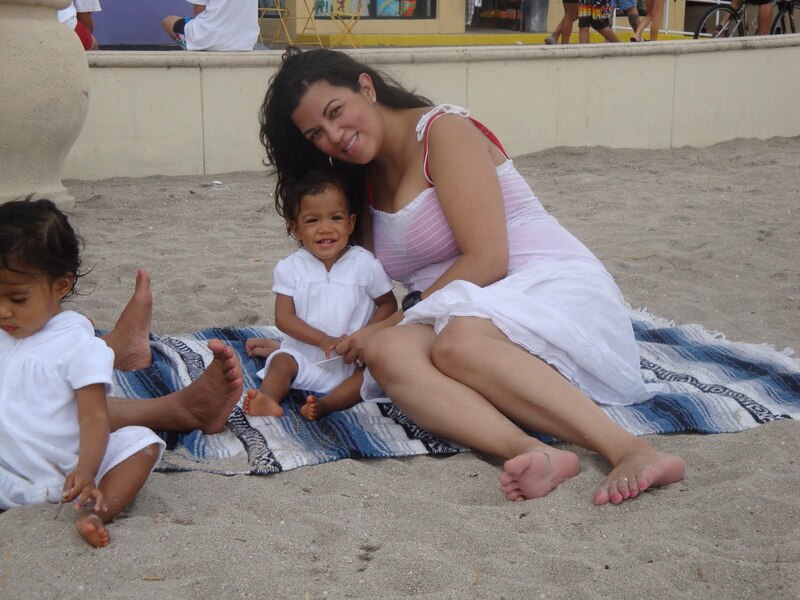 We’ve been in Florida now for over nine months; we can’t say the transition has been easy, but we can say that we are finally in a good place. We are in our own little home now, and can finally settle down. The neighborhood is like one out of a TV show, where every knows each other by name, and neighbors welcome us with apple pie. We are even blessed enough to be part of a golf community (even though, for now, we won’t have the luxury of playing golf for some time). Eva, trying to bring the tree in our backyard down, one branch at a time..
while Zoe contemplates whether to stay back or join in on the fun…. The girls love all the attention they get each time they meet someone new. Eva lights up the room with her smile as she tries to charm every person she meets, while Zoe clutches onto us tightly, fearing we’re going to hand her over to a stranger. At the beach, Eva is fearless. She threatens to jump out of our arms and into the water when we wade in the warm ocean waters. Zoe, however, wails each time the water splashes onto her, and won’t even put her feet down on the sand. 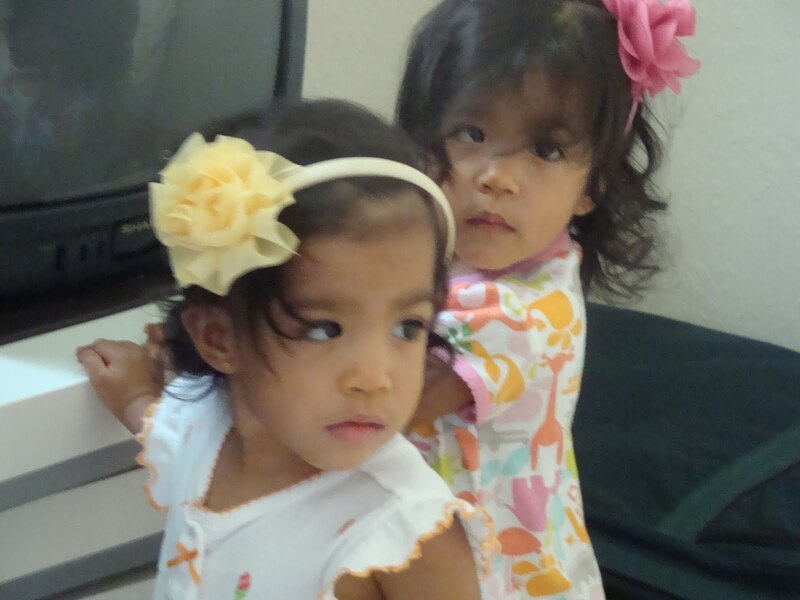 Despite being identical twins, our two girls have very distinct personalities. 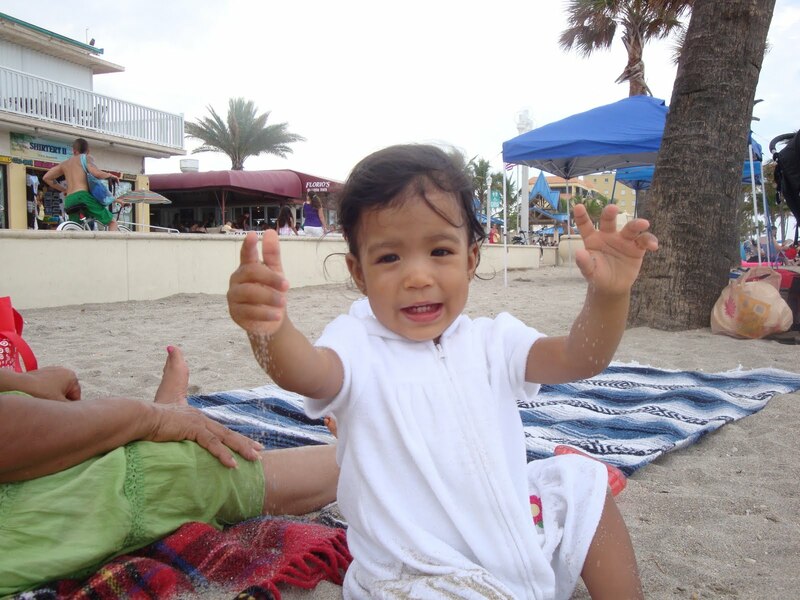 Eva – playing with sand…can’t get enough of the beach! We are blessed to have such sweet daughters and love every minute of parenthood. We are also very fortunate to have the help of my dear mom these days, who is staying with us in Florida for a while until we finish getting settled in. She has the patience of an angel, and the girls just love playing with her, and being silly. They are not used to being around others besides us, and just love the idea of having one more person to toy with and have chase them around the house. Eva grunts every time she hops on her little ride-a-long so that someone will push her, even though it’s been weeks since she learned to push herself along… Zoe practices her bilingual skills with my mom, as she repeats every little word and phrase she hears. There is so much love in our home these days. Our girls are blessed, and so are we. 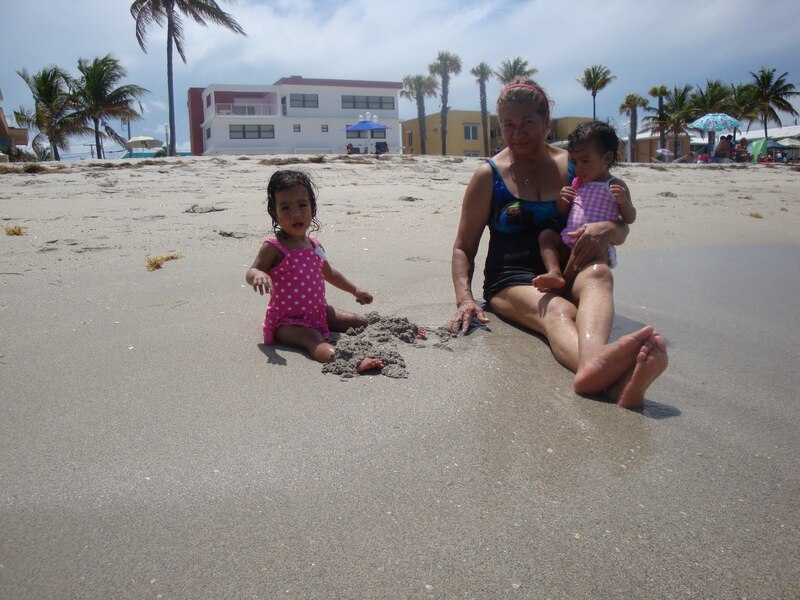 my little beach bunnies and their abuelita..